The TS9000 Series Jet Tech Valve is a piezoelectric driven, non-contact dispense valve capable of handling fluid viscosities to 2 million Cps and offers a fast jetting action producing hundreds of accurate deposits less than one second. 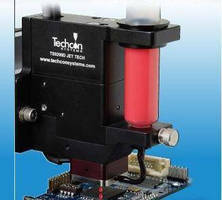 The Jet Tech features a compact size and modular design that can be integrated into robotic systems, and adjustable parameter settings allowing the operator to change the jetting properties for different fluid types and optimize the process for repeatable dispensing. A variety of nozzles shape and sizes along with different tappet configurations provides a wide spectrum of output jet deposits. Also at the show, Techcon will preview its new Bench Top Robot that has been designed for a wide range of fluid dispensing applications, from inline to batch. Three models are available (TSR2201, TSR2301 and TSR2401) to accommodate a wide range of working envelopes. The easy-to-program robot features dedicated fluid dispensing software, eliminating the need for complex robot language programming. With fully integrated positioning and fluid dispensing functions, the system is compatible with all Techcon Systems syringes, valves and jet dispensing systems. 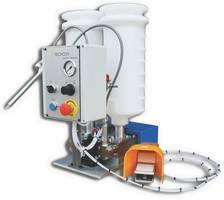 The TS6500CIM Series cartridge mixer provides complete automatic mixing of two-component material in a cartridge kit. The feature rich TS6500CIM Series cartridge mixer accommodates all standard size cartridge kits ranging from 2.5 oz (74ml) to 20 oz. (591ml) and is immediately usable anywhere in the world with its accompanying tools, accessories and universal power supply. High-quality consumable products include: 700 Series dispensing syringe barrels, which are silicone and chloride-free and designed to work with industry standard equipment; 700 Series syringe and components, which are made from low friction polypropylene to ensure accuracy, repeatability and productivity; and dispensing tips options, which include the TE Series Tips, TE Series Bent Tips, TT Tips, TS-P Plastic Tips, and Brush Tips. Cartridges are available in 2 ½, 6, 8, 12, and 20 oz. as well as 1/10 gallon capacities. Each size can be used with handheld or bench mounted air powered dispensing tools or manual dispensing tools. Cartridges are molded in either standard or low-density Polyethylene. The TS7000 IMP Series Auger Valves dispense material with a rotary displacement action using a rotary feed screw principle. During operation, air pressure pushes the material from the syringe into the feed screw chamber. 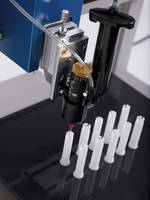 As the feed screw rotates, the material travels between the threads and out of the dispense tip. The feed screw is driven by the DC motor. TS7000 IMP incorporates a “Interchangeable Material Path” that allows for quick and easy replacement of the auger screw. The TS5540 Series Spray Valves are designed for precise spray applications of low viscosity materials. The TS5540-MS Microshot Spray Valve is designed to spray low viscosity materials through disposable dispensing tips. Spray patterns range from 0.18"-0.60" in diameter. The TS5622 Diaphragm Valves Series is designed to dispense low to medium viscosity materials with precision accuracy over a wide range of shot and bead sized down to a fraction of a micro liter. An internal spring return makes the valves fully adaptable for use with Techcon Systems time/pressure controllers. A short opening stroke provides extremely fast, positive shut-off. TS350 is capable of dispensing a wide range of fluid viscosities. It is immediately usable anywhere in the world with its accompanying tools, accessories and universal power supply. 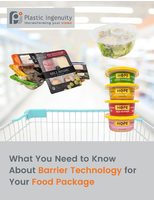 For more information, please contact the Techcon Systems team at +44 (0)2380 489 100 or visit www.techconsystems.com. Techcon Systems was established in 1961 to service industrial manufacturing markets and has continued to be a leader in fluid dispensing systems and products. In 1996, OK International acquired Techcon Systems, providing a strong global sales channel, with direct subsidiaries in the UK. Today, Techcon represents OK International’s Industrial Product Division. Currently focusing on fluid dispensing systems, Techcon’s components are used in medical, automotive, telecommunications, aerospace, and industrial applications worldwide, helping to improve manufacturing processes and increase the customers’ bottom lines. 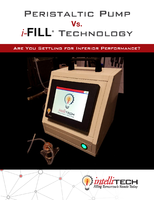 Techcon offers an array of fluid dispensing products and provides dispensing components ranging from disposable accessories to complete microprocessor-controlled dispensing systems, and precision valves. For more information, visit the company at www.techconsystems.com. Manual Syringe Assembly (1 cc) does not require compressed air. 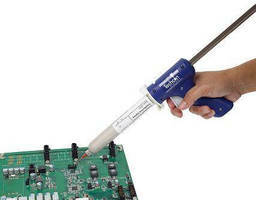 Manual Syringe Gun delivers optimal usability and control.